VIUDA NEGRA, one of the pioneering bands of Spanish Heavy Metal, has just released the 1st advance single of their first full-length Al Final/In the End, an album recorded in Spanish and English, which will be released in 2-CD through Fighter Records on April 2nd. 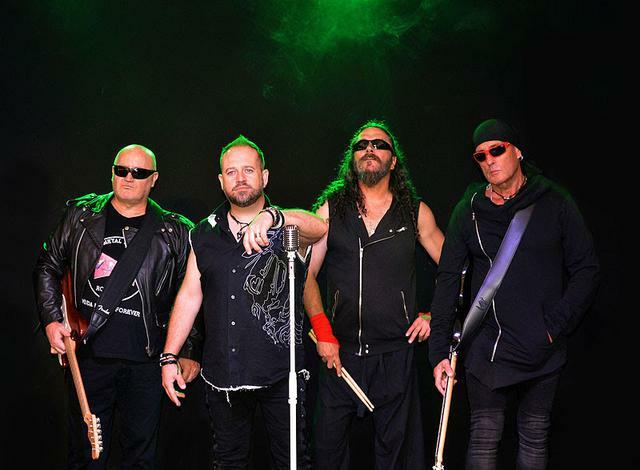 The current lineup of VIUDA NEGRA, which includes the members of the legendary original formation: Javier Gómez (guitar), Xavi Gómez (drums) and José Tomás (bass), with the incorporation of the vocalist Damián Chicano Ruiz (CHICANOS and EVIL HUNTER), return to the fray after more than 30 years, to continue forging Metal in the national and international music scene. Al Final/In the End shows a sober musical style with a sound and an own and recognizable identifying stamp. Striking guitars and solos, strong rhythms and melodies with an impeccable vocal quality that hook you to the first listen. The new album of VIUDA NEGRA is a work full of great songs of Heavy Metal and Hard Rock, songs that made them mythical in the 80's within the national Metal scene, and that now with this new recording and interpretation, with the current sound and arrangements, they make us enjoy a real Metal feast. We are going to enjoy those guitar duels, the shuddering solos and endless trepidating rhythms that will not leave indifferent any lover of the genre.